"Having fished and travelled with Seth Vernon regularly for the past six years or so I can think of no one who is a more dedicated guide nor better companion for a day on the water. He is always prepared and knowledgeable about the area and the fishing... his trips are carefully planned and his gear is impeccable." 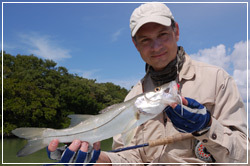 "We have caught trout in North Carolina, stripers on the Savannah, Redfish on flats around Edisto, and permit, snook and tarpon from Flamingo to the Yucatan. If you fish with him... don't plan on sleeping in because wether you are at a resort in Mexico or a campsite deep in the Everglades Seth will be up at 0 dark thirty waiting on you with a cup of coffee and a smile on his face, rigging rods, checking the weather itching to get out on the water. 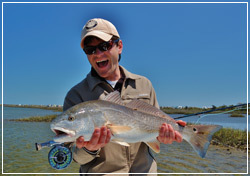 In short, be it salt water or fresh, I'll never pass up an opportunity to fish with Seth." "Dear Seth, thank you so much for hosting our fantastic trip in Dec. This thank you is late in getting to you, due to the holidays and the honeymoon. Tom Scipien and I had a great time on the water with you catching Winter Red Fish. I have been out with a lot of guides all over the world and I must say that you are absolutely the best saltwater fishing Captain I have had the pleasure of fishing with anywhere, ever! You do it the way I would do it. Your teaching style is expertly suggestive and the patience of a mentor. Your technical expertise is on point, equipment top notch, and conservation is at the heart of what you do and who you are. Your education and experience allow you to view the world from a global and scientific perspective regarding your line of business and your friendship is much appreciated. Not to forget your enthusiasm is wildly addictive and we had one hell of a good weekend! Looking forward to many more trips with you soon! On a personal note, both Tom and I really enjoyed hanging out with you, your lovely wife, and Ollie. Especially pulling one over on him. Awesome! 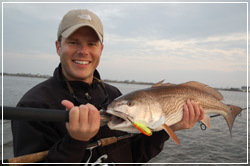 "I first picked up a fly rod in 2005 after some encouragement from Seth, who was then my boss at the Intracoastal Angler. He showed me a little bit about casting and then took me out on the water and let the fish teach me the rest." "Teaching a cocky 20 year old the skills that it takes to be successful at fly fishing could not have been very easy but Seth stuck with me. To be good at anything you have to have a mentor and Seth is mine in fly fishing. He has taught me everything from knots, to flies, to conservation and I owe everything I ever accomplish in fly fishing to him. 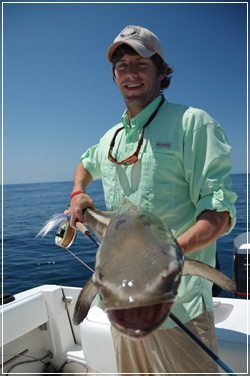 It was with Seth that I caught my first redfish, Spanish mackerel, ladyfish, Cobia, Amberjack, and Tripletail on the fly." "Seth has instilled in me what it is to be a sportsman, not just a fisherman. Seth has bestowed upon me the gift of fly fishing and the only thing I can do is pay it forward to someone else. Thank you Seth for all the memories but most of all for your friendship." "I've fished with many guides, from the flats of Honduras to the streams of New Zealand, and no matter where I am, I always think about the advice and lessons I've learned from being on the bow of Seth's skiff. While spending time on the water with Seth he continuously strengthens my angling skills and has given me the utmost respect for the saltwater fishery in North Carolina, one that I never knew was so impressive and delicate. I am a fishing guide myself, and unless it was for Seth, I wouldn't be doing what I love. His experience and wisdom on the water is something that is invaluable and will hook you, just as it did me, for a lifetime."